Last October NCTE members had the opportunity to participate in an exclusive conversation with Angie Thomas around the launch of the film adaptation of her book The Hate U Give. Later this month, a recording of this conversation will be available for NCTE members. Jocelyn: Our members and their students are anxiously awaiting February 5th, 2019, when they’ll finally get to meet Bri in your new book, On the Come Up. What should we know about her? 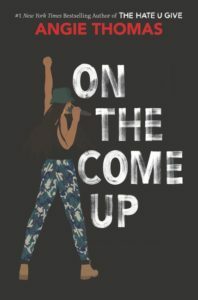 Angie: On the Come Up is about a 16-year-old girl named Brianna, who wants to be a rapper. I’ve had people say, “Why would you want to have a kid who wants to be a rapper? So many kids want to be rappers. Let’s encourage something else.” But that’s the point. So many kids in neighborhoods like mine want to be rappers, or they want to be basketball players, because that’s all they see. That, so often, unfortunately, is all they see of someone like them. That’s the only mirror they sometimes receive. And we’re talking about a mirror that shows them wealth and fame and all of these things. So of course they flock to it. This young lady [Bri], her life is turned upside-down when two things happen—her mom unexpectedly loses her job, the song she makes goes viral for all the wrong reasons, and she suddenly finds herself in the center of a controversy that’s too big for her to control. In The Hate U Give, I told teenagers, “You have a voice. It’s important. Use it.” But I would be doing them a huge disservice if I didn’t address the fact that so often when they do speak up and speak out, they’re criticized for how they speak, they’re policed on how they speak. Or they’re told that they’re too much this and they’re too little that. And [Bri] is a young lady who experiences those things. So for me, On the Come Up is telling them . . . “Make some noise. Even when it makes people uncomfortable. Even when it challenges the status quo. Make some noise.” And that’s what this book is about. It’s also a look at poverty and what that actually looks like in today’s day and age. It’s not the kid all the time—in America specifically—it’s not the child with the swollen belly begging for food. It’s the kid who only gets a good meal, maybe once a day. And also it’s a look at hip-hop, and it’s a look at hip-hop as an art form and as poetry. My hope, my big hope for this book—well, one of my hopes for this book—is that it is a gateway to poetry for so many young people. So my hope is that you all use it as a gateway to Nikki Giovanni, to Langston Hughes, to all of these poets—because so often, unfortunately, poetry—I remember when I was a teenager—poetry was presented to me as something that I wouldn’t be able to grasp, it was too bougie for me, you know. But the fact is poetry is not, poetry is very accessible if we show kids how to access it. So through hip-hop, through raps, that’s what I plan to do with On the Come Up. How are you planning to use this new text with your students? Let us know on Twitter! Looking for ways to bring Angie Thomas’s books into the classroom? Check out this lesson plan, Developing Critical Consciousness through Angie Thomas’s The Hate U Give, from ReadWriteThink.